right-click on the document in the “Document System” and choose Open document. The document is then opened in the “Document Browser”, and the icon next to the name of the document in the “Document System” changes from a sheet of paper to a sheet of paper with a pencil on it. You can now begin to work with the document in the “Document Browser”. You can code document or picture segments, attach memos, link segments, insert external links, edit text, or add new text. The window title displays the name of the open project and on the right there are some icons for controlling the display. The coding bar is located directly underneath it, with which you can code the document. Coded segments in the document are visualized in the gray side area with so-called “coding strips”. In the memo column, you can attach yellow memos with notes on the data. For texts, as shown in the example, there is a column with paragraph numbers immediately to the left of the text, and each paragraph that is not empty receives a consecutive number in MAXQDA. You can use these numbers as sources for citations from the material. In MAXQDA’s Document Browser you can only open and edit one document. But you can still open two documents simultaneously, each in in a separate document browser. This is helpful notably for conducting literature reviews: Open a publication as a PDF in one window and code thematically, directly from the document. 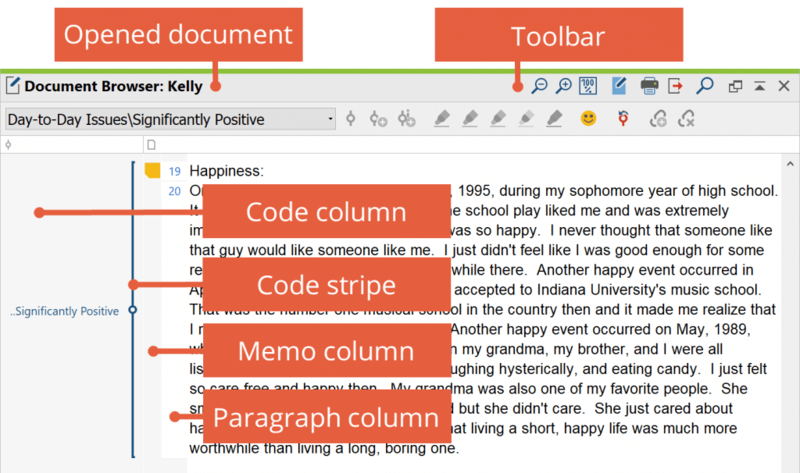 You can simultaneously open and code a text document in which you have made your notes in the second window. 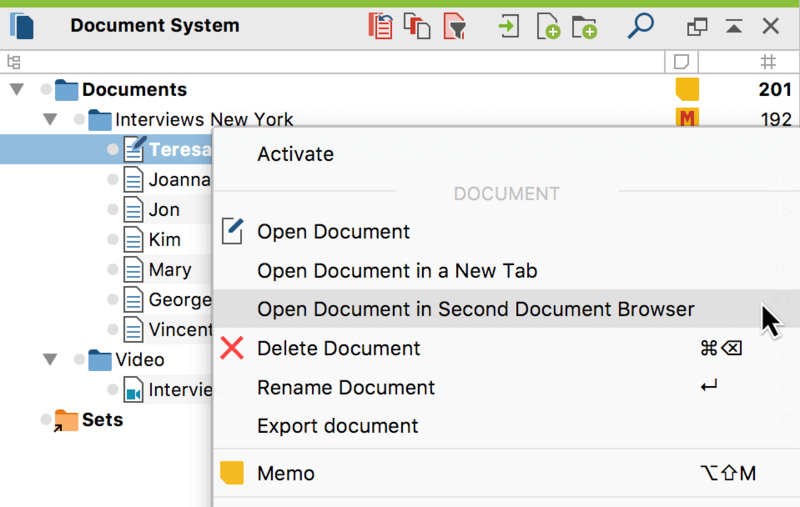 To open a document in its own document browser, right-click on the document in the “Document System” and select and select the option Open document in second Document Browser. The second document browser will open and display the selected document. When you click on a document link within a document, it will open in a second document browser, while the original document or section remains displayed. This allows you to view both linked document sections at the same time. You can find further information on document links here. The drop-down “Code” toolbar is always displayed in the first document browser. The second document browser will display its own Code toolbar. If the same document is displayed in both the document browsers, newly added codes are displayed immediately in both browsers after they are created; the display is thus synchronized. Clicking on the source data in the “Retrieved Segments” window always brings up the selected segment in the standard document browser, not in the new second document browser. The same is true for browsing the segments in the “Overview of Coded Segments”. In the second document browser, you can switch to edit mode at any time by clicking the button, to make changes to the document. Please note that only one of the two open documents can be in Edit mode at a time. Please note: If the same document is open in both MAXQDA document browsers, it is not possible to edit the document. MAXQDA includes the option of opening more than one document in the “Document Browser” at once, each opened in a separate tab. This allows you to switch quickly back and forth between documents. Once you have opened documents in tabs, you can switch to any of them by clicking on the appropriate tab at the top of the “Document Browser”. Documents can be opened in tabs by holding the Shift key and double-clicking on the document or by right-clicking on the document and selecting Open in a new tab. Once a document has been opened in this way, tabs will appear at the top of the “Document Browser” with the names of each of the documents open. You can switch between the documents by clicking once on the appropriate tab. The tabs can be closed individually. If tabs are already open, a document opened in the normal fashion from the “Document System” will appear in the currently selected tab in the “Document Browser”. Tip: To open all documents in a document group in Tabs, drag the document group into the Document Browser with the left mouse button, then release.